Hands, D. Wade 2013. Introduction to symposium on ‘reflexivity and economics: George Soros's theory of reflexivity and the methodology of economic science’. Journal of Economic Methodology, Vol. 20, Issue. 4, p. 303. Callebaut, Werner 2011. Beyond Generalized Darwinism. II. More Things in Heaven and Earth. Biological Theory, Vol. 6, Issue. 4, p. 351. WADE HANDS, D. 2008. INTROSPECTION, REVEALED PREFERENCE, AND NEOCLASSICAL ECONOMICS: A CRITICAL RESPONSE TO DON ROSS ON THE ROBBINS-SAMUELSON ARGUMENT PATTERN. Journal of the History of Economic Thought, Vol. 30, Issue. 04, p. 453. Hausman, D.M. 2001. International Encyclopedia of the Social & Behavioral Sciences. p. 4159. Hands, D. Wade 1994. Restabilizing Dynamics: Construction and Constraint in the History of Walrasian Stability Theory. Economics and Philosophy, Vol. 10, Issue. 02, p. 243. Vilks, Arnis 1992. 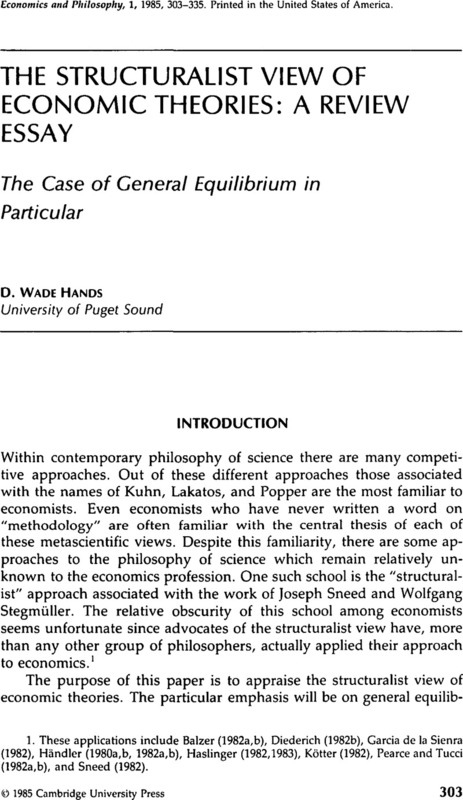 A Set of Axioms for Neoclassical Economics and the Methodological Status of the Equilibrium Concept. Economics and Philosophy, Vol. 8, Issue. 01, p. 51. Lind, Hans 1992. A Case Study of Normal Research in Theoretical Economics. Economics and Philosophy, Vol. 8, Issue. 01, p. 83. Salanti, Andrea 1991. Roy Weintraub's Studies in Appraisal: Lakatosian Consolations or Something Else?. Economics and Philosophy, Vol. 7, Issue. 02, p. 221. Hausman, Daniel M 1989. Economic Methodology in a Nutshell. Journal of Economic Perspectives, Vol. 3, Issue. 2, p. 115. Caldwell, Bruce J 1988. Developments in Economic Methodology with Implications for Political Science. Politics, Vol. 8, Issue. 2, p. 43. Hands, Douglas W. 1985. The logical reconstruction of pure exchange economics: Another alternative. Theory and Decision, Vol. 19, Issue. 3, p. 259. Agassi, J. and Wettersten, J.R. 1980. “Stegmüller Squared.” Zeitschrift für Allgemeine Wissenschaftstheorie 11:86–94. Arrow, K.J. and Hahn, F.H. 1971. General Competitive Analysis. San Francisco: Holden-Day. Balzer, W. 1982a. “A Logical Reconstruction of Pure Exchange Economics.” Erkenntnis 17:23–46. Balzer, W. 1982b. “Empirical Claims in Exchange Economics.” In Philosophy of Economics, edited by Stegmüller, W., Balzer, W., and Spohn, W.. New York: Springer-Verlag, pp. 16–40. Balzer, W. and Moulines, C.U. 1980. “On Theoreticity.” Synthese 44:467–494. Balzer, W. and Sneed, J.D. 1977. “Generalized Net Structures of Empirical Theories I.” Studia Logica 36:195–211. Beatty, J. 1980. “Optimal-Design Models and the Strategy of Model Building in Evolutionary Biology.” Philosophy of Science, 47:532–561. Becker, G.S. 1981. A Treatise on the Family. Chicago: University of Chicago Press. Blaug, M. 1980. The Methodology of Economics. Cambridge: Cambridge University Press. Boland, L.A. 1982. The Foundations of Economic Method. London: George Allen and Unwin. Brown, E.C. and Solow, R.M. (editors). 1983. Paul Samuelson and Modern Economic Theory. New York: McGraw-Hill. Caldwell, B.J. 1982. Beyond Positivism: Economic Methodology in the Twentieth Century. London: George Allen and Unwin. Chipman, J.S. 1965. “A Survey of the Theory of International Trade: Part 2, The Neoclassical Theory.” Econometrica 33:685–760. Chipman, J.S. 1966. “A Survey of the Theory of International Trade: Part 3, The Modern Theory.” Econometrica 34: 18–76. Debreu, G. 1959. Theory of Value. New Haven: Yale University Press. Debreu, G. 1974. “Excess Demand Functions.” Journal of Mathematical Economics 1:15–21. Debreu, G. 1982. “Existence of Competitive Equilibrium.” In Handbook of Mathematical Economics, edited by Arrow, K.J. and Intriligator, M.D.. Amsterdam: North-Holland, Vol. 2, pp. 607–743. Debreu, G. 1983. Mathematical Economics: Twenty Papers of Gerard Debreu. Cambridge: Cambridge University Press. Debreu, G. 1984. “Economic Theory in the Mathematical Mode.” American Economic Review 74:267–278. Diederich, W. 1982a. “Stegmüller on the Structuralist Approach in the Philosophy of Science,” Erkenntnis 17: 377–397. Diederich, W. 1982b. “A Structuralist Reconstruction of Marx's Economics.” In Philosophy of Economics, edited by Stegmüller, W., Balzer, W., and Spohn, W.. New York: Springer-Verlag, pp. 145–160. Fang, J. 1970. Bourbaki. Hauppauge, N.Y.: Paideia Press. Feyerabend, P. 1977. “Changing Patterns of Reconstruction.” British Journal for the Philosophy of Science 28: 351–382. Garcia de la Sienra, A. 1982. “The Basic Core of the Marxian Economic Theory.” In Philosophy of Economics, edited by Stegmüller, W., Balzer, W., and Spohn, W.. New York: Springer-Verlag, pp. 118–144. Hamminga, B. 1982. “Neoclassical Theory Structure and Theory Development: The Ohlin Samuelson Programme in the Theory of International Trade.” In Philosophy of Economics, edited by Stegmüller, W., Balzer, W., and Spohn, W.. New York: Springer-Verlag, pp. 1–15. Hamminga, B. 1983. Neoclassical Theory Structure and Theory Development. New York: Springer-Verlag. Händler, E.W. 1980a. “The Logical Structure of Modern Neoclassical Static Microeconomic Equilibrium Theory.” Erkenntnis 15:33–53. Händler, E.W. 1980b. “The Role of Utility and of Statistical Concepts in Empirical Economics: The Empirical Claims of the Systems of Aggregate Market Supply and Demand Functions Approach.” Erkenntnis 15:129–157. Händler, E.W. 1982a. “The Evolution of Economic Theories: A Formal Approach.” Erkenntnis 18:65–96. Händler, E.W. 1982b. “Ramsey-Elimination of Utility in Utility Maximizing Regression Approaches.” In Philosophy of Economics, edited by Stegmüller, W., Balzer, W., and Spohn, W.. New York: Springer-Verlag, pp. 41–62. Hands, D.W. 1985a. “The Logical Reconstruction of Pure Exchange Economics: Another Alternative.” Theory and Decision. 17, forthcoming. Hands, D.W. 1985b. “Karl Popper and Economic Methodology: A New Look.” Economics and Philosophy. 1:83–99. Haslinger, F. 1982. “Structure and Problems of Equilibrium and Disequilibrium Theory.” In Philosophy of Economics, edited by Stegmüller, W., Balzer, W., and Spohn, W.. New York: Springer-Verlag, pp. 63–84. Haslinger, F. 1983. “A Logical Reconstruction of Pure Exchange Economics: An Alternative View.” Erkenntnis 20: 115–129. Hausman, D.M. 1981a. Capital, Profits, and Prices. New York: Columbia University Press. Hausman, D.M. 1981b. “Are General Equilibrium Theories Explanatory?” In Philosophy of Economics, edited by Pitt, J.C.. Dordrecht: Reidel, pp. 17–32. Jaffe, W. 1983. William Jaffe's Essays on Walras, edited by Walker, D.A.. Cambridge: Cambridge University Press. Kötter, R. 1982. “General Equilibrium Theory-An Empirical Theory?” In Philosophy of Economics, edited by Stegmüller, W., Balzer, W., and Spohn, W.. New York: Springer-Verlag, pp. 103–117. Kuhn, T.S. 1976. “Theory-Change as Structure-Change: Comments on the Sneed Formalism.” Erkenntnis 10:179–199. Laudan, L. 1977. Progress and Its Problems. Berkeley: University of California Press. Leinfellner, W. 1983. “Marxian Paradigms versus Microeconomic Structures.” In Epistemology, Methodology, and the Social Sciences, edited by Cohen, R.S. and Wartofsky, M.W.. Dordrecht: Reidel, pp. 153–201. Lloyd, E. 1984. “A Semantic Approach to the Structure of Population Genetics.” Philosophy of Science 51:242–264. Mantel, R.R. 1977. “Implications of Microeconomic Theory for Community Excess Demand Functions.” In Frontiers of Quantitative Economics IIIA, edited by Intriligator, M.D.. Amsterdam: North-Holland, pp. 111–126. McFadden, D., Mas-Colell, A., Mantel, R., and Richter, M.K. 1974. “A Characterization of Community Excess Demand Functions.” Journal of Economic Theory 9:361–374. Morishima, M. 1977. Walras' Economics. Cambridge: Cambridge University Press. Moulines, C.U. 1975. “A Logical Reconstruction of Simple Equilibrium Thermodynamics.” Erkenntnis 9:101–130. Moulines, C.U. 1976. “Approximate Application of Empirical Theories: A General Explication.” Erkenntnis 10: 201–227. Moulines, C.U. 1979. “Theory-Nets and the Evolution of Theories: The Example of Newtonian Mechanics.” Synthese 41:417–439. Moulines, C.U. 1983. “On How the Distinction Between History and Philosophy of Science Should Not be Drawn.” Erkenntnis 19:285–296. Pearce, D. 1981. “Is There Any Theoretical Justification for a Non-Statement View of Theories?” Synthese 46: 1–39. Pearce, D. 1982. “Stegmüller on Kuhn and Incommensurability.” British Journal for the Philosophy of Science 33: 389–396. Pearce, D. and Tucci, M. 1982a. “On the Logical Structure of Some Value Systems of Classical Economics: Marx and Sraffa.” Theory and Decision 14:155–175. Pearce, D. and Tucci, M. 1982b. “A General Net Structure for Theoretical Economics.” In Philosophy of Economics, edited by Stegmüller, W., Balzer, W., and Spohn, W.. New York: Springer-Verlag, pp. 85–102. Popper, K. R. 1959. The Logic of Scientific Discovery. New York: Harper. Shafer, W. and Sonnenschein, H. 1982. “Market Demand and Excess Demand Functions.” In Handbook of Mathematical Economics: Volume II, edited by Arrow, K.J. and Intriligator, M.D.. Amsterdam: North-Holland, pp. 671–693. Shoven, J. B. and Whalley, J. 1984. “Applied General Equilibrium Models of Taxation and International Trade: An Introduction and Survey.” Journal of Economic Literature 22: 1007–1051. Sneed, J.D. 1971. The Logical Structure of Mathematical Physics. Dordrecht: Reidel. Sneed, J.D. 1976. “Philosophical Problems in the Empirical Science of Science.” Erkenntnis 10:115–146. Sneed, J.D. 1982. “The Logical Structure of Bayesian Decision Theory.” In Philosophy of Economics, edited by Stegmüller, W., Balzer, W., and Spohn, W.. New York: Springer-Verlag, pp. 201–222. Sneed, J.D. 1983. “Structuralism and Scientific Realism.” Erkenntnis 19:345–370. Sonnenschein, H. 1973. “Do Walras', Identity and Continuity Characterize the Class of Community Excess Demand Functions?” Journal of Economic Theory 6:345–354. Stegmüller, W. 1975. “Structures and Dynamics of Theories.” Erkenntnis 9:75–100. Stegmüller, W. 1976a. The Structure and Dynamics of Theories. New York: Springer-Verlag. Stegmüller, W. 1976b. “Accidental (‘Non-substantial’) Theory Change and Theory Dislodgement: To What Extent Logic Can Contribute to a Better Understanding of Certain Phenomena in the Dynamics of Theories.” Erkenntnis 10:147–178. Stegmüller, W. 1978. “A Combined Approach to the Dynamics of Theories.” Theory and Decision 9:39–75. Stegmüller, W. 1979. The Structuralist View of Theories. New York: Springer-Verlag. Suppe, F. (editor). 1977. The Structure of Scientific Theories. 2nd ed.. Urbana: University of Illinois Press. Suppe, F. 1979. “Theory Structure.” In Current Research in Philosophy of Science, edited by Asquith, P.O. and Kyburg, H.E.. East Lansing: Philosophy of Science Association, pp. 317–338. Suppes, P. 1961. “A Comparison of the Meaning and Uses of Models in Mathematics and the Empirical Sciences.” In The Concept and the Role of Model in Mathematics and Natural and Social Science, edited by Freudenthal, H.. Dordrecht: Reidel, pp. 163–177. Suppes, P. 1979. “The Role of Formal Methods in the Philosophy of Science.” In Current Research in Philosophy of Science, edited by Asquith, P. D. and Kyburg, H. E.. East Lansing, Mich.: Philosophy of Science Association, pp. 16–27. Tuomela, R. 1978. “On the Structuralist Approach to the Dynamics of Theories.” Synthese 39:211–231. Weintraub, E. R. 1979. Microfoundations. Cambridge: Cambridge University Press. Weintraub, E.R. 1983. “On the Existence of Competitive Equilibrium: 1930–1954.” Journal of Economic Literature 21:1–39.